The 58-metre bridge ensures the local community can once again access local amenities within five minutes, when they had been forced to travel for over an hour following the worst natural disaster on record to hit Puerto Rico. The faster connection also allows the agricultural community, the backbone of the local economy, to continue trading. 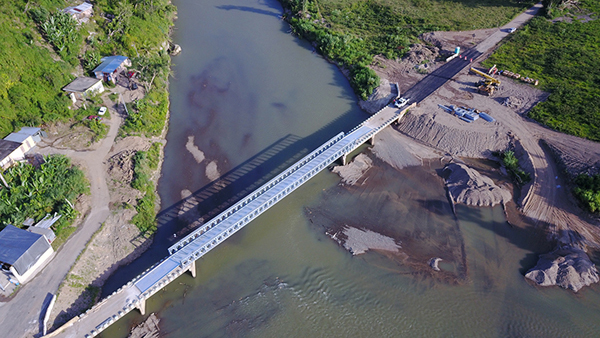 Due to the importance of this vital link – which connects a rural community to larger, urban areas – there was an urgency to deliver a new bridge in under three months. Mabey partnered with Viatek Corporation and Construcciones José Carro, S.E. to deliver the bridge within the record timeframe set by the Eastern Federal Lands Highway Division (EFLHD), supporting the Puerto Rican government’s tireless efforts to reconnect communities as quickly and efficiently as possible following the disaster. The 58-metre Mabey Compact 200 (C200) was installed with emergency civilian ramps and integrated into a series of concrete abutments which remained following the hurricane. The C200 is Mabey’s most widely used modular bridging product, with a heritage that stretches back over 70 years to the original Bailey Bridge system. The compact bridge can be used for both permanent and temporary applications and is one of the most cost-effective and fastest-to-implement bridging solutions available. It can also carry up to two lanes of traffic, with options for both external and internal footwalks.